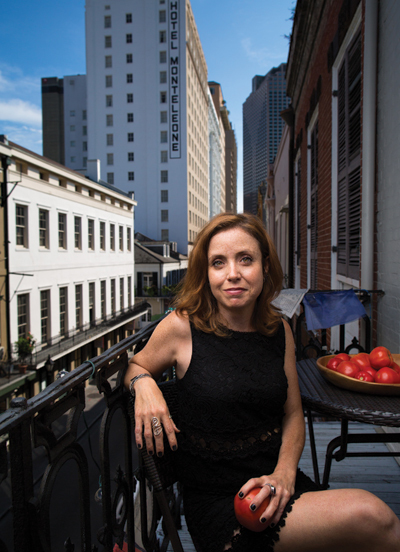 A globetrotting food activist calls New Orleans home. The nature of Danielle Nierenberg’s career means she can make virtually anywhere in the world her home base, but the 37-year-old activist and author chose New Orleans. Nierenberg travels the world as the co-founder of Food Tank, a “food think tank” specializing in education, research and advocacy around issues of food security and sustainable agriculture worldwide. She also keeps a busy speaking schedule, appearing regularly on MSNBC, Fox News and Al Jazeera. She’s given talks at major international events like World Food Prize, The New York Times Food for Tomorrow Conference, TEDxManhattan, Edible Institute and more. And she’s written articles and op-ed pieces for major publications like The Wall Street Journal, The New York Times, USA Today and Bloomberg Businessweek. The Defiance, Missouri native says she didn’t always have a robust understanding of the issues facing agricultural systems and farmers. This understanding was developed during Nierenberg’s undergraduate studies at Monmouth College in Illinois. The small liberal arts school allowed her to develop her own major, which she built around environmental policy and government with a healthy dose of science courses for a strong foundation. Then, Nierenberg completed a Peace Corps stint in the Dominican Republic as an environmental awareness educator, where she shared a bathroom with 16 or 18 neighbors, experienced clean water shortages, started a tree nursery and worked closely with farmers. One aspect of her project was working in a school district running environmentally focused summer camps and helping teachers develop learning materials. “In a lot of developing countries it’s just a lot of memorization, and there’s no sort of interaction, so we tried to really work with these awesome teachers who were doing a lot with very little, to incorporate more of that and to have me there when I could be so that the kids got something a little bit different,” she says. Next it was on to Tufts University’s School of Nutrition, Science and Policy for a Masters in Agriculture, Food and Environment. After eight years working at Washington, D.C. environmental think tank Worldwatch Institute, Nierenberg founded Food Tank. Nierenberg’s schedule would be exhausting to someone with less passion. Meeting the people she’s helping firsthand keeps her inspired. Nierenberg hopes to add more voices from her home community and encourages anyone with relevant information on the food movement in New Orleans to contact her at foodtank.com.